Most items are 50% off for the first 24 hours that they are listed. Follow me and catch the savings on your TpT homepage! 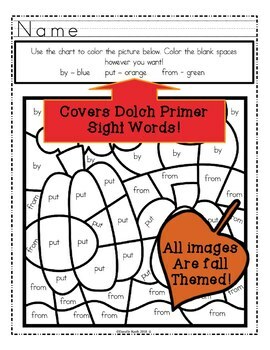 15 Fall themed coloring pages that are color by sight word. This set covers Dolch 1st Grade Sight Words. There are 8 different designs, but the repeated designs feature different words and colors as appropriate to the design. 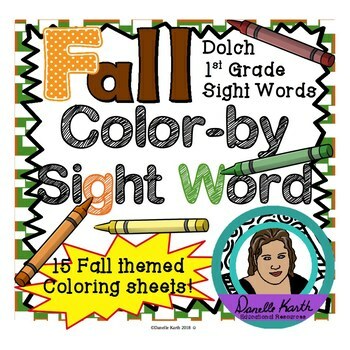 This set is for those looking for a fast and fun way to reinforce Dolch 1st grade sight words. These worksheets can be used by teachers, parents, and homeschoolers. This set covers Dolch 1st grade sight words. 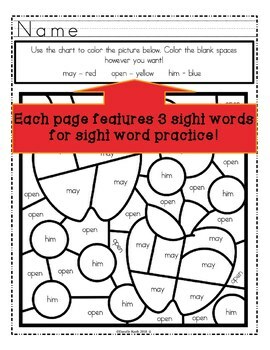 These worksheets are easy to use, no prep, print and go worksheets. 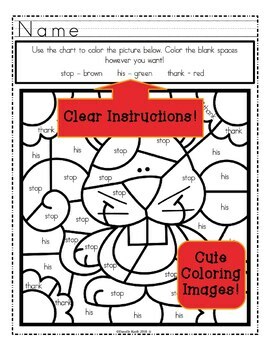 Print them out, hand them out with coloring tools, and sit back for a moment of rest or more likely, a moment of doing something else! These worksheets can also be used for early finishers, used as homework, or sent home for additional practice for those that need a little extra help. TpT awards you with credits every time you make a purchase and then go back and leave a review on that item. This is a great way to share with sellers how you feel about their products and a great way for you to share with other buyers whether or not the product is likely to meet their needs and expectations. You will get one credit for every dollar you spent. Those credits can then be used at checkout for future purchases from any store on TpT! This is for a single user license. One person (teacher or parent) can use this product repeatedly in their classroom or home. However, they should not share the product with others (either digitally or in print). Thank you for your cooperation to keep prices on TpT low! You are always welcome to leave questions here at my store. I try to be very prompt when responding and usually get back to people within a day. You can also email me with any comments, questions, or concerns at danellekarth@gmail.com. Thank you for your time! I hope you like this product!